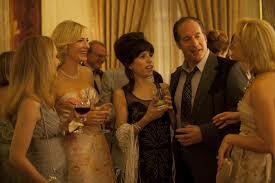 Woody Allen’s Blue Jasmine is that rare film achievement that radiates with intelligence and artistry. It begins typically with the Woodman’s simple credits and a jazzy score but immediately drops the familiarity of his wise cracks and comedic situations. Cate Blanchett’s portrayal of a terribly sad and lost woman becomes front and center in what is both fascinating and tragic. At the age of 77, writer/director Allen unravels a tale in brilliant fashion. He still stands tall as a great American filmmaker. There’s some humor to be found, but it almost a nervous humor because you can see how absurd behavior is going to lead to a terrible outcome. It’s like watching a pretty, sleek car – Blanchett’s Jasmine – about to have a wreck but you can’t take your eyes off it. Blue Jasmine has a beautiful look as it glides between San Francisco in the present and New York City in flashbacks, with cinematographer’s Javier Aguirresarobe brilliant work never distracting from the story. The tale is familiar – it’s a Bernie Madoff-like story of financial skullduggery. For theater buffs, it could be a knock-off of the classic play A Streetcar Named Desire with its situation of a mad woman seeking refuge at her sister’s home. There are two Stanley Kowalski-like characters to match Blanchet’s Blanche Dubois. But that resemblance to Tennessee Williams’ classic is just a jumping off point for Allen’s excellent original script. Streetcar was a black-and-white nightmare – this is colorful and something audiences can really relate to. And like Streetcar, Blue Jasmine may gain legendary status for its brilliant acting. Cate Blanchett has long been a great screen presence – here, she outdoes every brilliant role she’s done before. She’s in her elegant mode but fearless in showing the character’s warts. Great acting doesn’t need an Oscar, but the Academy may be hard pressed to find anything better than this. Sally Hawkins also deserves kudos as the sister Ginger. In fact, every performance shines. Seeing Andrew Dice Clay knock off the wonderfully etched character of Augie is great. And Alec Baldwin is perfect in his non-showy, important role. Being a die-hard Woody Allen fan, I’ve seen this film three times now and have never been bored. For those out there who are not fans of this filmmaker, they many find Blue Jasmine to be the least typical of his work, besides a brilliant portrait of our times. Jasmine is a hopeless character but the great artists involved here make us care.